When we launched our website, we promised that we’d be giving updates on the development of Return 2 Games. Since we’re still working hard to get everything ready for the big reveal of the first game in the series (which is coming up in about a month and a half) we won’t dive into any details of the game just yet. But in the meantime, we thought it would be cool to show the main theme of the series, and talk a bit about the process of its realization. Hopefully this will be an interesting read as we somehow ended up recording live orchestra and everything was done on an indie budget! Note: If you’re not interested in the detailed making-of of the theme, click here to jump straight the final result. Creating the main R2G theme was a very important and sensitive task due to all the requirements and expectations. After some initial talent search, we decided to work with Paweł Błaszczak, an award-winning composer credited for the soundtracks of such games as Dead Island, Call of Juarez, and the Witcher. 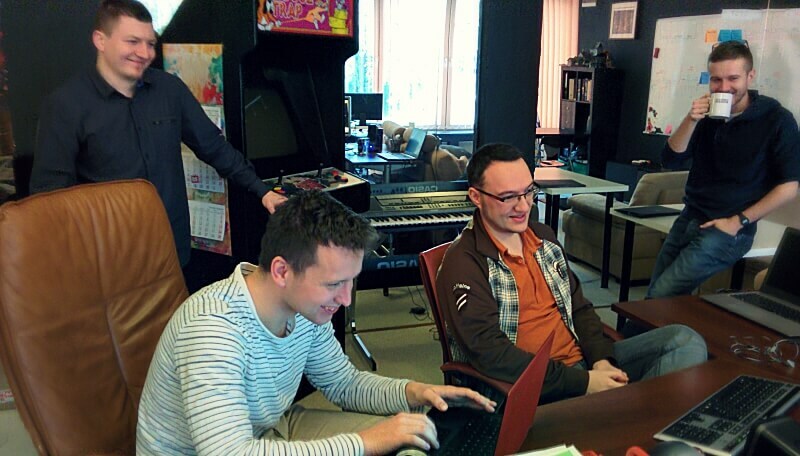 We knew Paweł would not let us down, as he already created some great music for us when we were working on the puzzle game Ancient Quest of Saqqarah back in 2007 in the Codeminion days. In fact, Paweł will be doing most, if not all, of the music for R2G. We always knew that we wanted a strong theme for R2G. We needed something catchy and adventurous since each of the games in the series will be an adventure of its own. …but then we stumbled upon the 99 Dollar Orchestra Kickstarter campaign. So basically, you pay a 100 bucks, and get a 7 minute professional recording of a live orchestra playing your music. As you can probably guess, we were instantly sold on the idea. We really didn’t know what to expect, but we wanted to try it out. The consensus among our team was that it would either sound like crap, or it might be good enough to layer it over the sampled version to give it a more real feel. We never expected it to be so good that it would replace the excellent virtual rendition prepared by Paweł. After all, come on… $99 for live orchestra recording?! So how did it go? Did it sound like crap? Did we end up using it in the game? Read on to find out! Let me start with a few words of caution about some caveats we quickly run into. First, the 99 Dollar Orchestra is fairly small. It’s 30 instruments compared to 70-100 instruments in a big symphonic orchestra. Second, you need an orchestral score (sheet music with notes) for your music, something we didn’t have as the theme was never intended to be played by a real orchestra. Last, but certainly not least, you must know that you are purchasing session recording time. This time not only includes the orchestra actually playing, but also the musicians practicing, and the conductor giving instructions to the musicians. The people who will be playing your music will be seeing the score for the first time and most probably, especially if the piece is difficult like in our case, they won’t get it right the first time… or the second time… You get the idea. Having learned about all those problems we could turn the idea down, but we’ve already made our minds and we wanted very much to see what could come out of it. The orchestra size was never an issue for us, as we would be layering the recordings over the sampled version. The 99 Dollar Orchestra didn’t have a harp, choir, or epic drums, so some parts would have to stay sampled. The last two problems got sorted out after we talked to André Miranda, head of the Kickstarter project. He recommended that we purchase at least 20 minutes of recording time so that the orchestra has enough time to practice (we wanted to record two parts – a 90-second theme and 45-second intro). He also told us that they can create the necessary transcription for an additional fee. At this point we were really hooked on the idea and excited to hear our score performed live so we ended paying more that we initially intended, $400 in total. Then we waited for the campaign to end and recording sessions to begin. We think that everything turned out fine. The experience recording the orchestra was fun and enlightening and we don’t regret investing our time and money into taking this extra step in the making of the theme. But if you ask me if I would recommend recording orchestral music this way for an indie team, this would be a tough call. You can’t expect a flawless rendition of your music, unless you are willing to pay a lot, and you will have to dedicate extra time to mix and prepare everything. Some pieces will work better than others. Nevertheless, if you really need live orchestra for your project, this is the only option that we know about that fits an indie budget. You can download Return 2 Games Theme in mp3 and flac.